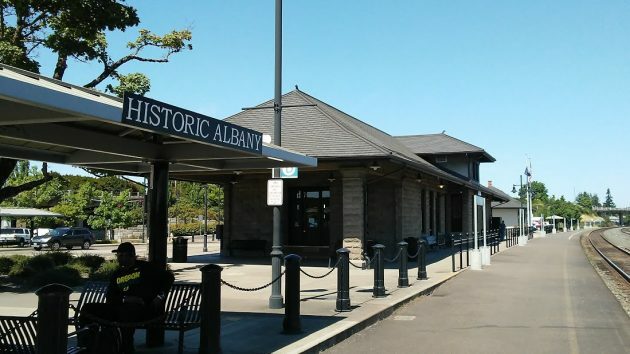 Visitors arriving by train are reminded right away of Albany’s important role in Oregon history. 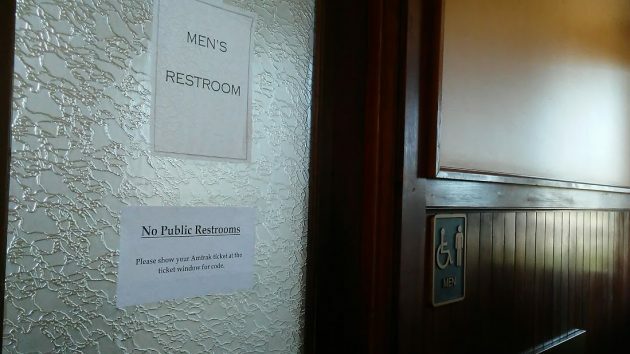 Somebody had told me about this, and sure enough, the sign says there are “no public restrooms” in this facility, which the public spent millions of dollars acquiring and then renovating in 2005. There are keypads on the doors, and you’re supposed to ask an Amtrak agent for the combination. When I inquired about this, I learned that contrary to the small print, you don’t actually have to have an Amtrak ticket to get the combination. If, for example, you’ve been waiting to meet someone arriving on the Starlight, and the train is late and you kind of have to go, you can ask and get access even without a ticket. I can see Amtrak’s problem, if they have to clean up after lots and lots of people, including perhaps the vagrants that hang out on the nearby path to Swanson Park. But the station is supposed to be a public transportation hub. Local and regional bus lines stop there and sometimes passengers have to wait to make connections. Accessible facilities are an absolute necessity. This situation needs to be fixed. What else did I notice at the station? 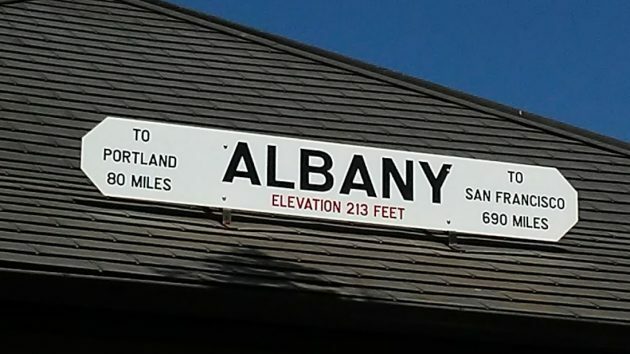 There’s a new “Albany’ sign on the southwest roof. The old one broke and fell off during the winter of 2015-16. The new one is of metal, but it gives travelers the same information as the old wooden one: The station’s elevation and the distance to Portland and San Francisco. The sign was made in the city shop, and it’s been up since October, I was told at City Hall. I rode my bike to the Portland & Western office on the other side of the yard. There I learned that the car is parked in Albany because it’s close to the rail company’s regional office in Salem, that the company occasionally uses the car for meetings, and that the Lebanon-based Albany & Eastern borrows it now and then for its train excursions. The public restroom situation in town is an ongoing problem. The Montparnasse train station in Paris has pay toilets. Easily accessible, keeps gratuitous vandalism down and helps pay for upkeep. In Zurich, there are blue lights in the public restrooms so drug users can’t find a vein and go elsewhere. I like your comment about looking around. I wish Albany would look around and find a solution for this basic human need. As it is, corners, trees and shrubbery are being used by those who don’t have ready access. If you build it, they will go. I was raised to be a good guest regardless of whether I was at a relative’s home, a friend’s home, at a hotel, on an airplane or in a public accommodation. Having worked in retail, in food and beverage, in the hotel/motel industry and having traveled, I can tell you that there are many people who should never be allowed to leave their homes. They may be neat and tidy at home, but once they leave, the world is their trash can. 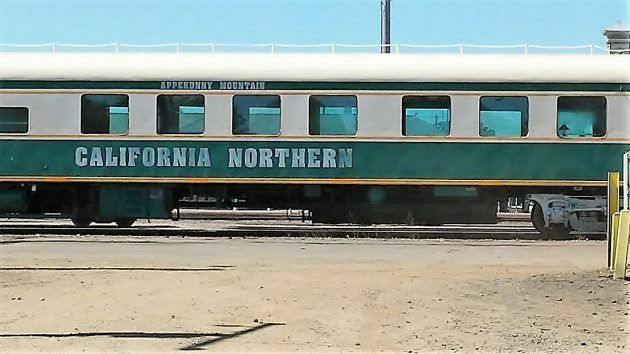 I’ve noticed the passenger car parked in the rail yard for many years and I’ve wondered about it’s past and current use. It’s nice to know that it still is used. It does make me think of other uses such as what the Oregon Electric Restaurant does in Eugene (rail cars for dining area). Public toilet facilities have always been problematic. Common decency requires that we provide this utility, but there are those who abuse the privilege. When I was a kid in England in the 40s I was taught the solution. The beat Bobbys (policemen) were required to carry a supply of the old huge British pennies, which were the price of admission to public toilets. I was told that if I ever needed to use one I could get the admission price simply by asking one of the friendly policemen for it. Simple and clever at the same time. Shame on Amtrak. When Nature calls, even Kings must answer. San Francisco? When was the last time a train from here went there? They used to load cars onto ferries ages ago. The new sign could have mentioned another destination opposite Portland..
As I recall, all points on the Southern Pacific were marked by their distance from SF, where the company was headquartered, regardless of whether trains went that way. Actually, on Southern Pacific timetables trains going from Portland to Tillamook were going west. Regarding San Francisco. Yes, you can take Amtrak to the San Francisco. I take the Amtrak to the Bay Area frequently. The Starlight stops on the Oakland side of the bay, and then they provide a short bus ride to get across the bridge and into San Franciso. I have found it easy to just book my trip to Jack London square in Oakland, then either walk or take the city bus to the Bart (their light rail) and just take that into San Francisco. The Bart is about 12 blocks from the Amtrak station. During much of the week, and into the night, they have a free shuttle that one can take from the Amtrak at Jack London Square to the Bart. On Sunday, however, one needs to either walk, or pay $2 to take the regular city bus. My family and I have done this trip twice in the past four year or so and enjoyed a weekend in San Francisco.